Colomé, A.; Pardo, D.E. ; Alenyà, G.; Torras, C.
Our current work on external force estimation without end-effector force sensor is resented.To verify if a grasp of a textile has been successful, the external wrench applied on the robot is computed online, with a state observer based on a LWPR  model of a task. Colomé, A. [et al.]. 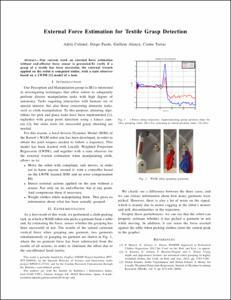 External force estimation for textile grasp detection. A: IROS Workshop Beyond Robot Grasping: Modern Approaches for Learning Dynamic Manipulation. "Proceedings of the 2012 IROS Workshop Beyond Robot Grasping: Modern Approaches for Learning Dynamic Manipulation". Vilamoura: 2012, p. 1.